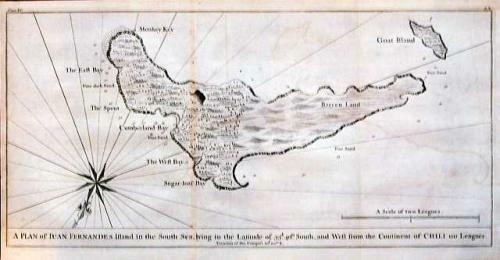 A plan of the island of Juan Fernandes (Robinson Crusoe's island) off the coast of Chile. The island was visited by George Anson in 1741 after great hardships in sailing around Cape Horn. Anson complained about the inaccuracies of the charts then available and made it an aim of his voyage to create a new and accurate set of charts for future mariners. He was conscious of the importance of this work for the future of British trade on the high seas. The map is orientated with north to the bottom and shows the coast lines of Juan Fernandes and Goat Islands. A feature of the map are the cliff faces and only two possible mooring sites, the primary one being Cumberland Bay. Depth soundings have been noted. George Anson, commander of a Pacific squadron, was given orders by the Admiralty to raid Spanish possessions along the South American coast and disrupt their trade. What was to be a reasonably short trip turned out to be a circumnavigation of the globe and including the sacking of Paita (Peru) and the captured of the Spanish galleon Nostra Seignora de Cabadonga (which was loaded with silver and two important maps that detailed the route Manila galleons had followed across the Pacific for almost two hundred years). Captain Anson's mission took him 45 months and cost, 6 ships lost, 1000 men lost to scurvy, 300 men lost to typhus and dysentery, and unknown number to shipwrecks and only 4 in action.